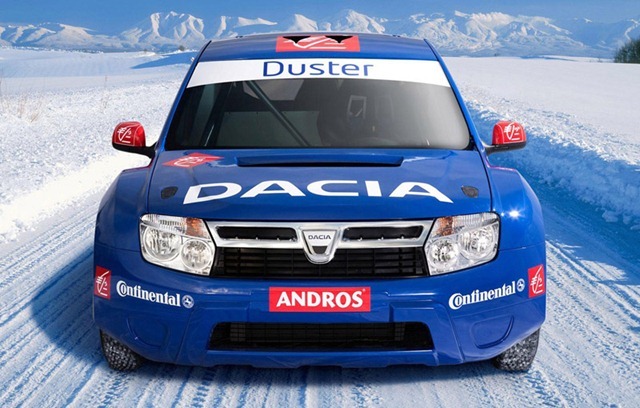 The French from Le Blog Auto announced today that Renault could prepare a 850 HP version of the Dacia Duster. The model will be manufactured at the request of the French driver Jean-Philippe Dayraut for participation in 2011 edition of the Pikes Peak International Hill Climb (the competition is held annually on the top of Pikes Peak in Colorado, USA, has 19.99 kilometers, covers a difference of 1439 meters between start and finish, has 156 turns and a average slope of 7%). The news is especially surprising as Jean-Philippe Dayraut is competing in the Andros Trophy for BMW and against Alain Prost, who is driving the Duster Ice, a special version developed by Renault for this competition. According to French journalists, Dayraut has already established contacts with Tork Engineering and Renault – the two companies that have manufactured the Duster Ice – to develop a super version of the Duster. If it will be produced, will have under the hood an engine that will develop 850 horsepower and that will derive from the V8 Nissan GT-R competition. The total mass of the car would be only 900 kilograms. But nothing is official at this time, the rumors circulate only through the paddock of Andros Trophy.